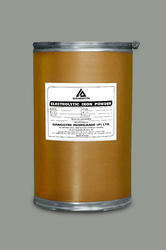 Our range of products include electrolytic reduction iron powder. For reasons of quality standardization, processing of this range of Iron Iron Powder Electrolytic Reduction is done as per the FDA set guidelines. Owing to the finest ingredients and modern machines used in its making, the offered product has a longer shelf life and an impeccable effectiveness. In addition, the offered range is marked at the best rate possible, making it highly asked for in the market.